* “When Borders declared bankruptcy in February, more than 200 of its 400 outlets were still ‘highly profitable,’ says its final chief executive officer, Mike Edwards.” Location, location, location. Some were good, others not so good. It’s really too bad that Borders’ overall debt picture was sufficiently poor that it was unable to restructure itself, close the unprofitable locations, focus on the ones that were working, and rebuild itself a leaner, meaner company. — The downturn in the economy. — Tough competition from Amazon. — Extremely late (and poor) embrace of online book retailing. — Too much in investment in CDs and DVDs, just as customers were switching to digital downloads. — Too much expansion of brick-and-mortar locations. Good locations are the key for bookstores, and a larger physical footprint may not be better. * Brick-and-mortar stores can’t really compete based on having a large in-house inventory. No matter how large the store’s inventory is, it’s nothing compared to Amazon, which essentially stocks all in-print books, among other items. * Barnes & Noble may have to start trimming its own less-than-profitable locations. We’ve seen just a few hints that this may indeed be going on, so perhaps there is some traction to the idea of an upcoming B&N downsizing. keep your eyes peeled for more indications that this is happening. A couple updates to the recent collapse of Borders (as I mentioned previously). First, there is one small bright spot thus far — it looks like Books-A-Million is interested in acquiring around 30 of the 399 Borders locations. If that deal goes through, it would save somewhere on the order of 10% of the jobs expected to be lost with Borders’ closure, so that would indeed be good news for those employees and the communities those locations serve. Note though that Books-A-Million, like Barnes & Noble, is not doing all that well this past year (the article linked above provides details), but hey, any port in a storm I guess. And second, the obvious question is, so what happens now to book retail? What can we say about the market as a whole? Well, it’s not a particularly rosy picture. 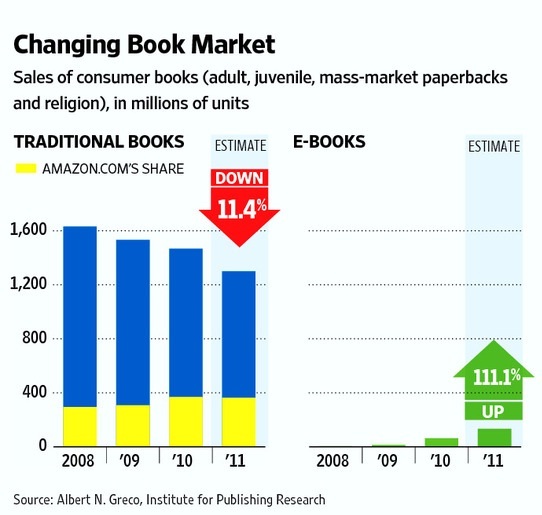 The physical book market is expected to fall 11% this year, with a 21% decline since 2008. The eBook market is compensating for some, but not all, of this decline, and the eBook market is expected to more than double this year, with 111% growth expected. That’s huge, and we certainly can’t ignore it, but as the UK case study shows us, when physical bookstores go away, customers don’t automatically just buy books elsewhere. In a significant number of cases, folks use their disposable income for other non-book purchases altogether. That’s bad for all of us, as it means that Borders’ closure may have a ripple effect on the industry as a whole. As we all suspected, Borders will be liquidating. All the 399 remaining stores will be shutting down by the end of September, and the liquidations likely begin at the end of this week. Kind of sad. That leaves us with B&N, Books-a-Million, a dwindling supply of small regional chains and mom & pop stores, and the Internet. It won’t be much harder to actually acquire books (Amazon is still your friend, after all), but it does mean that an important piece of bookish “culture” and community will be gone. Alas. I’m back blogging, folks. The travails of completing a dissertation have drained me of any interest I might have in blogging or doing much creative writing over the last couple months. I’m not done with the dissertation, not by a long shot, though I still hope to defend next Spring, but life goes on and I hope to resume regular blogging and book reviews. I have a few reviews lined up over the next few weeks, and some interesting book-related news pieces I’ll relate as well (been saving those up). Let me start with a news item and the rest will follow in the days to come: Borders, as we all know (I last blogged about it at the end of April), has been in serious trouble for at least the last year, though it’s been in slow decline for the last few. It entered Chapter 11 a few months ago, and has not yet been able to produce a plan to bring it out of its apparent death spiral. Well, I suspect that it’s going to bite the dust, and sooner rather than later. The latest and greatest deal to save Borders fell through and it looks like it’s facing liquidation next week. This does not bode well for the remaining 399 Borders stores or their employees. Keep in mind that Barnes & Noble, the only other big book retail chain in the U.S., is also not doing terribly well, though it’s managed to survive better than Borders because it jumped into online book retail on its own fairly early on, and its eBook/eReader business is still pretty viable as the biggest competitor to Amazon. A billionaire businessman (wouldn’t we all like to be described that way?) by the name of John C. Malone has expressed an interest in B&N, and is purportedly interested in taking the company private. There’s been a lot of discussion as to why Malone, a demonstrably smart guy, would want to spend $1 Billion on a company in a dying industry, with most speculating that he’s primarily interested in the eBook side of the company. Should be interesting to see if this deal ends up going through. The judge has approved approximately $6 million in bonuses, if the company can negotiate at least $10 million in rent reductions from its various landlords. What a great deal! As one of the bankruptcy trustees said, “the bonuses were premature because Borders has only been in bankruptcy two months and hasn’t shown how it will reorganize or pay unsecured creditors.” All they’ve got to do is go to a handful of landlords and threaten to close those stores if they don’t receive a rent reduction, then *bam* the company bigwigs get their bonuses. No need to show a plan for actually, oh I don’t know, paying back their debtors or keeping the rest of their stores afloat. Business as usual, and, sadly, with the collusion of a judge. Judge Martin Glenn ought to be ashamed of himself. As we all know, Borders is not doing well. It’s in Chapter 11, it mostly has to pay its vendors in cash, it’s already closed more than 220 stores and is in the process of closing another 20 or so. It’s an ugly situation. About a week ago (I’ve been out of town), Borders presented a restructuring plan for the company to its creditors (mainly traditional publishers) in an effort to boost confidence in the company. The bad news is that by all accounts, the restructuring plan hasn’t had a positive effect, and most creditors are still not confident that the company will survive. And in local news, our local Borders is gone now. We grabbed a lot of really deeply discounted books in the last week or so, but boy was it bittersweet. Author Chuck Wendig has a post I simply must direct you to: he calls it “Scenes from the Bookpocalypse.” Wendig describes some of the sights he and his wife witnessed at the closing of his local Borders bookstore. It’s both funny and poignant, and it particularly resonates with me because my wife and I also went to our local Borders (also closing) this weekend, then again on Monday when they dropped prices an additional 10%. We picked up a pretty good number of books between us, all stuff that we wouldn’t have purchased at full price, and in many cases, not even for Amazon’s usual discount on trade paperbacks. Not much left in the store now, I’ll bet, but if they dropped all prices another 10%, I’d head back. Wendig makes an interesting point: “People still want books, it seems. They just don’t want to pay full price.” The stores had been packed for these discount sales, though it was dead on Monday night, but obviously no one wanted to pay full retail price for books at Borders. Amazon has certainly helped drive down the reading public’s expectations for what they should have to pay for a new book. And traditional publishers’ prices for eBooks — often as much if not more than for a physical copy of the book — are nuts, especially when you compare them with the price that most “independent” authors sell their eBooks for: $0.99 – $2.99. That’s about what most people want to pay for a book that will take them a couple hours to finish, then they’ll never pick it up again. And in a matter closely related, Borders is trying to get their bankruptcy judge to sign off on $8.3 million in “incentives and retention bonuses” for company “key employees.” CEO Michael Edwards alone will take home $1.7 million in bonuses if the judge signs off on the deal. Bet all those laid-off clerks and store managers are really rooting for Edwards and the “key” members of his team. Riddle me this, Batman — why exactly would a company want to retain the executives who led the company into bankruptcy, much less offer them bonuses to stay on? You and I both know that the deal will inevitably be approved and the bigwigs amply rewarded for doing a bad job of running the company. Another great example of Nero fiddling while Rome is burning. In addition to the 200 or so stores Borders announced a while back that they were closing, they’ve just announced that they’re closing an additional 27 stores (one more store was saved at the last second by concessions from the store’s landlord). Additionally, Borders is now again receiving delivery of new stock from at least some of its vendors, but it now has to pay for them cash-on-delivery (COD). How many Borders stores will be left by the end of the year? My wife and I hit the local doomed Borders this weekend, and while their stock is fairly well picked-over, they’re still only offering most books for 30% off. When you factor in our local usurious sales tax (nearly 7%), they still can’t compete with Amazon. Admittedly, the remaining mainstream fiction, romance novels, and biographies are at 40% off already. When they hit 50% off, I’ll head back there and scavenge a few things. I’ve been following the bankruptcy of Borders for a while now (see here for my last post on the subject), and came across another good piece that analyzes the issue. A second new analysis by the former head of Borders UK examines some of the reasons for the bankruptcy. The short answer is that, well, it’s complicated and a result of a series of screw-ups on Borders’ part that go back years. It’s funny, my wife and I went to our local Borders’ store closing event last weekend, and pretty much everything in the store was marked down by 20%. The place was absolutely packed, and the checkout line verged on a Christmas Eve level of customers. The whole thing was silly though, because after you factor in the local 6.75% sales tax, people were clamoring to buy books at around 15% full retail. Which is silly, given how frequent 33-50% off store coupons have been, and how deep Amazon’s discounts are. Why would I want to buy a book for 15% off, when I could wait a few days and get the same book for around 30% off? One of the exceptions was the magazine section — magazines were marked down 40%, and I did buy one of them. It highlights the problem that brick-and-mortar new bookstores have: why exactly would customers buy books from them? Businesses win customers because they either provide a unique good or service, or can beat their competitors on price or customer service. And providing a nice browsing experience/environment and decent customer service just isn’t enough to survive, I suspect. As a follow-up to the last post about Borders going bankrupt, I’d like to provide a link to another blog that puts what we’re seeing in the book retail industry in its proper context. As Harry MCracken, the author of that piece, notes, the possible death throes of Borders and Barnes & Noble are symptomatic of much larger trends in the retail industry. Changes in the industry — and by that I largely mean store closures — seem to be accelerating in recent years, but the process began at least eight years ago. Between changing consumer demands, the increasing availability and desirability of digital rather than physical media, and Internet retailers like Amazon, brick-and-mortar retailers of physical media are having a rough time of it. I have no doubt that some of them will survive, in some form, but it’s going to be a painful transition, with the outcome still unclear. I think it’s safe to say that the physical media retail industry (books, music, movies, etc.) of 2020 is going to look very different from today.